This was posted on May 1, 2011 by Teri Maxwell. The Holly Homemaker series has managed to draw itself out to encompass quite a few articles. It started from a blog post on Titus2.com and a negative comment about that post. By now you are probably very familiar with the blog post and comment, but in case we have a new reader or you want to refresh you memory, here it is one more time. From the blog comment, we are left with the feeling that the author believes that if a child is given more than a few small chores to do, he will not have any playtime. This is really far from the truth. 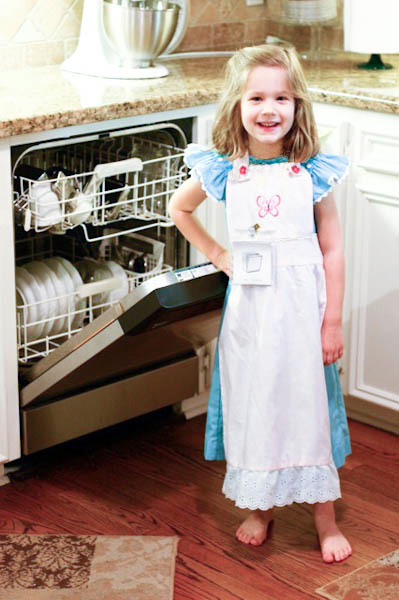 After the first Holly Homemaker Mom’s Corner, the mom who had originally sent us the photo of her five-year-old daughter with her ChorePack unloading the dishwasher wrote to us. She was a little taken aback at the assumptions that were made in the blog comment concerning her daughter’s activities. This is what she said. “I was so sad to hear about the woman who commented negatively and was thrilled to see your response. The sad thing is that the commenter does not even know the full story. We also use your scheduling system, and there is plenty of time scheduled for my daughter to play dress up, babies, play with her sister and brother, do school, and crafts, etc. I think this woman has no idea what your ChorePack system is about and the time actually involved in them. My daughter DOES want to be a mommy when she grows up and like you, I think it honors the Lord for her to do so. “As far as how much time the chores take, my daughter is five so she is responsible for eight things in the morning: praying (she can’t read yet), getting dressed, putting PJ’s away, making her bed, brushing her hair, filling the cat’s water bowl, unloading the top rack of the dishwasher, and brushing her teeth. ALL of this takes her less than 20 minutes in the morning; sometimes she even gets her little sister dressed in that same amount of time. “We also have an afternoon ChorePack where she waters our two houseplants, makes sure her room is picked up, puts books and toys away, sets the table, and is the kitchen helper if it is her day (she trades off with her brother). I would say this one takes her a maximum of thirty minutes because she usually helps me train our almost two-year-old in picking up her toys as well. So chores ALL DAY take less than an hour which leaves eleven hours for fun and school since the children are up from 7 a.m. to 7 p.m. The precious, little ChorePack-using girl’s mom gives us a good perspective of what her daughter’s day looks like and how much of it she is spending doing chore work. The jobs are reasonable to her age and capability. Her mommy is helping her invest her time in productive activities like chores and school while allowing plenty of time for play. To be honest with you, I wonder if the children who will grow up to be lawyers and astronauts aren’t quite possibly the ones who are learning to work at home rather than the ones who are addicted to TV, movies, and Xboxes. I remember a conversation we had with one of our neighbors who drives a public school bus. She told us that she asked the children on her bus how many of them played outside. Only two raised their hands. She decided to give them a “play-outside challenge.” We had recently had a seven-inch snow, and there was still a lot of snow on the ground. She told her bus children that when she came to pick them up in the morning, she would give a reward to any child who had built a snowman by the bus stop. There was only one child who responded to the challenge of building a snowman that was visible on the route the next day. That child was treated to a McDonald’s Happy Meal. When children are given chores to do, they are learning to apply themselves to a task that needs to be accomplished. They have something productive to do with a portion of their time. With practice at their chores, they become responsible, diligent, thorough, careful, and efficient. They also learn how to manage their time. All of those are qualities that a professional will need just as much as the Holly Homemaker needs them. The children who learn how to work at home will have the perseverance and determination to apply themselves to difficult tasks they will face in adulthood–whether that is starting a business, becoming an astronaut or lawyer, or raising a family. Sadly, the children who grow up without being encouraged to work will likely choose to avoid work in their adult lives. They will perpetuate their childhood into their adult years and wonder why they struggle so much. Remember from the March 2011 Holly Homemaker Mom’s Corner where the professional couldn’t find young employees because none of those who applied for the jobs knew how to work? I agree with Mom O that as the children pitch in to help in their homes, Mom’s workload is lightened. This allows her not only her more time to play with her children, talk to them, and read to them, but it also helps facilitate a more joyful, content overall attitude. A happy mom is often the foundation of a happy family. In the past, Steve and I listened to those, like the negative blog commenter, who would want us to choose not to give our children chores but rather simply let them play and have fun. We also evaluated the results of that kind of parenting, and we didn’t like the results. We saw appetites developed for self and entertainment but we desired our children to have appetites to serve. Working helped our children toward the servant’s heart found in Scripture. “For, brethren, ye have been called unto liberty; only use not liberty for an occasion to the flesh, but by love serve one another” (Galatians 5:13). Others, as they have shared through this series of articles, have seen the bad results of children not learning how to work, as well. This was usually from personal experience in the area of not having been given chores as they were growing up. When we did a survey of Christian families before writing Managers of Their Chores, overwhelmingly we heard back that these families wanted to teach their children how to work. About 75% of the respondents came from families where they were not required to do household chores, and they felt that decision by their parents had hindered them as adults. They didn’t have the skills they needed or the attitudes toward work that they wanted. They simply weren’t equipped for what they would face as adults. These families are making different decisions for their children, decisions that include a positive attitude toward chores and teaching their children to handle chore responsibility. I think in this series we have now covered each of the concerns the negative blog commenter had about a five-year-old having a ChorePack to help her do some household chores. I am happy that I can be a Holly Homemaker and that one of the things I can do being home with my children is to teach them how to work. We want our children equipped for their adulthood through the skills they are learning when they work in our home plus the work ethic that comes with chores as well. May we be women who look beyond the cries of the world that says a child’s days should only consist of fun and choose to prepare our children for life.